Christmas is not far away and I got some nice blue Christmas theme napkins to decoupage some of the Christmas gifts. This is another one of my glass bottle decoupages. I will not be share the decoupage how to here, as you may find it on my other posts. I’ll tell you how to make the snow effect on your glass bottle decoupage. 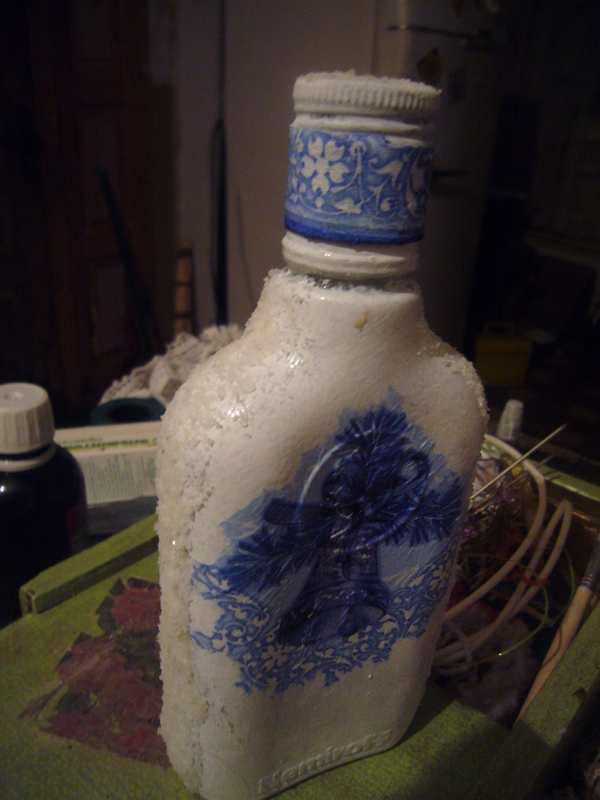 You may see something that looks like snow on this Christmas gift decoupaged glass bottle. Here is how I make it. After I finish up the decoupaging process and cover up the bottle with polish, I let it dry. Then I apply PVC glue to the spots, where I want the snow effect. Then I put some salt on it and let it dry. It’s that simple. Once it dries up well, I remove extra salt. It looks great and it’s easy indeed. This is a great way to use recycled craft to make some Christmas gifts. 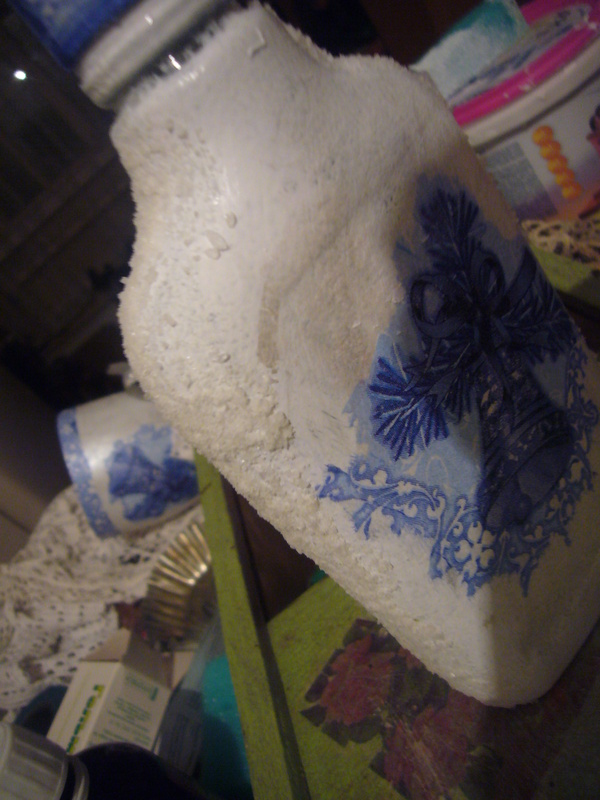 Glass bottle decoupage is easy, but it makes wonders with ordinary things. This entry was posted in Crafting Tutorials, Decoupage ideas, Uncategorized and tagged blue christmas, busy moms, christmas, christmas gifts, Christmas theme glass bottle decoupage, crafts, creative tips, creativity, decoupage, decoupage how to, decoupage step by step, decoupage tips, DIY, green living, handmade, home decor, how to decoupage, recycled craft, repurpose, snow effect on decoupage, theme napkins, tips for moms, upcycling. Bookmark the permalink.